Giants War kicks off in Wonder Woman #66, written by G. Willow Wilson, with pencils by Cary Nord, inks by Mick Gray, and colors by Romulo Fajardo Jr., and with it comes an intriguing new partnership for Diana. Previously, the inhabitants of Olympus and Themyscira disappeared from their homes, and started popping up in various places in man’s world (that’s good, old-fashioned Earth for you new kids). With the hope that her fellow Amazonians might have been deposited somewhere nearby after so many years of not being able to visit them, Wonder Woman set out on a quest to find them, accompanied by Aphrodite. Now, a giant Titan has been spotted running through the forest, causing all kinds of havoc, and only one person is big enough to help Diana out in this kind of jam--her old foe, Giganta. Wilson kicks off this arc with a light-hearted, whimsical bang, if there is such a thing, and that tone seems to be right in her wheelhouse. 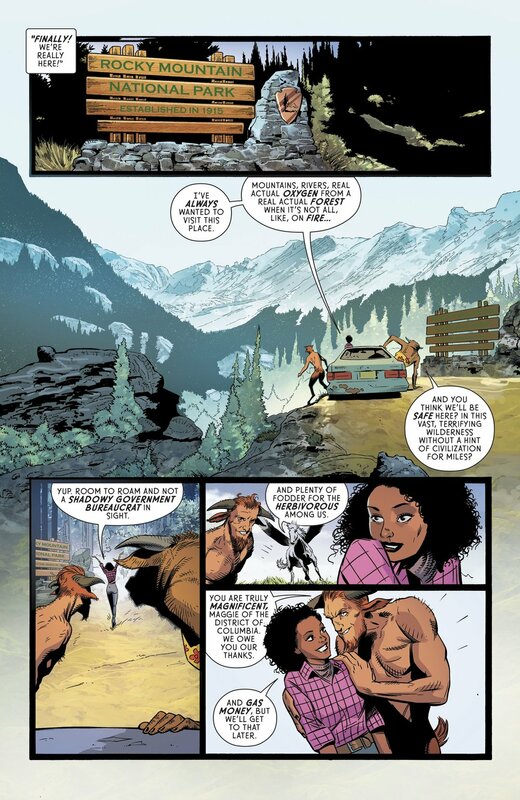 She started a little uneven at the beginning of her run, but with each issue released, Wilson appears to be learning new lessons and improving her skills as a Wonder Woman writer. This chapter continues her use of humor to drive a story, while also spotlighting the positive nature of Diana in even the direst of situations. Speaking of Diana’s good nature, she is forced to work with one of her oldest foes this time around, and it makes for some of the best moments of the book. Yes, Wonder Woman needing help to fight giant rock monsters is a flimsy excuse to get these two enemies together, but the why’s of it all are addressed in-story, so there’s no need to overthink it. 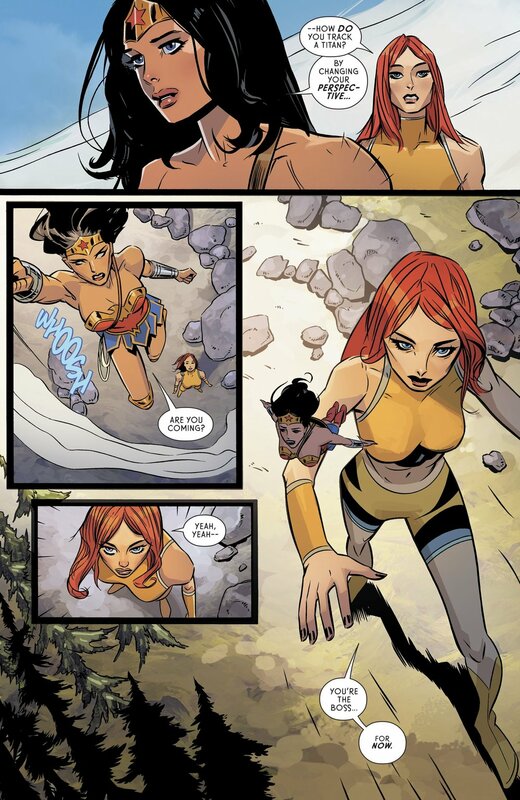 It’s also possible that Diana just saw the perfect opportunity to try to forge a bond with Giganta, and show her what it’s like to be a hero. If that also seems like a stretch, you probably don’t know Wonder Woman that well. She tends to talk first, and punch only if necessary, and Wilson has demonstrated a proclivity for showing off that particular trait when it comes to Diana dealing with her enemies so that it would fit perfectly into her characterization of Diana. Either way, the duo make for a fun team, as they couldn’t be more opposite characters. Wilson might be writing the first buddy cop comedy starring Wonder Woman, and there wouldn’t be anything wrong with that. Nord returns to penciling duties this chapter and proves to be adequate at the job of drawing Wonder Woman, but still, nothing to write home about. His art is fine for the most part, but occasionally he skimps on the details in the oddest areas, like Diana’s face, and those instances can pull you out of the story quick. Gray on inks and Fajardo on colors do their best to bring their side of the art duties up to A-level, but they can only do so much, leaving an otherwise excellent book looking “meh” in the visuals department. Overall, Wilson has set up what looks to be a fun arc with its opening chapter. This issue will leave you wondering (pun intended) if Diana can use her Titan-hunting time to turn Giganta to the side of the angels, or if the overly-tall villainess will take advantage of Wonder Woman’s good nature, and try to escape. Either way, there seems to be plenty to look forward to in this book in the coming months, so it would be wise to stick around.